This unique digital clock is built around a circa 1960 Burroughs decimal counting module (model DC106A, serial #554). 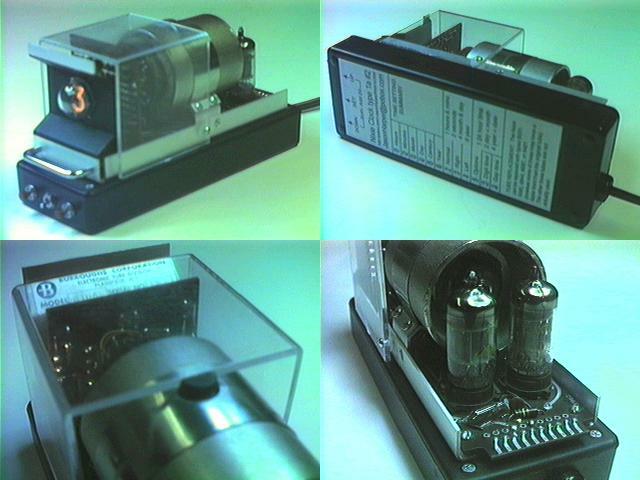 The module incorporates a Beam-X switching tube (also known as a Trochotron), a fascinating but short-lived technology that used crossed electric and magnetic fields to produce a vacuum tube with ten stable states, capable of counting at rates in excess of one million per second. The module's display is an end-view Nixie tube with 5/8" digit height. 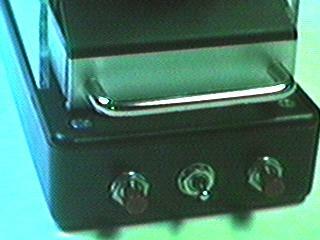 The module has been mounted on top of a black plastic project box containing the clock's electronics and setting switches. A clear plastic cover prevents touching the portions of the module that contain high voltages. Before reading any further, please understand that this clock is somewhat of a fake - it doesn't actually use the Beam-X tube at all, it drives the Nixie display directly. I chose to do things this way due to lack of documentation on the counter module, and the fact that some previous experimenter seems to have modified the module (so it wouldn't necessarily operate according to specifications, even if I had those specifications). There is one huge advantage to this: you'll never have to worry about replacing the Beam-X tube, which would likely prove to be impossible - they show up occasionally on eBay, but mostly later versions which did not need the huge external magnet and shielding required in this module. Dimensions are approximately 3" wide, 4.25" high, and 8.5" deep. The clock weighs about 2 pounds 9 ounces, much of which is due to the cylindrical magnet and shielding surrounding the Beam-X tube. Timekeeping based on the 60 Hz powerline frequency (which has extremely good long-term accuracy), plus a backup capacitor to keep the clock running at reduced accuracy for up to 20 minutes or so during a power failure. The date and all display options are stored in EEPROM, so that generally only the time will have to be reset even if backup power is exhausted. Here's a mockup of what the clock actually looks like in operation. The time initially shown here is 4:17 (it could be either AM or PM, there's no way to tell other than using a 24-hour display format). These buttons are mainly used for setting the clock, but can also select one of two alternate displays. About the only feature of the actual clock missing from this simulation is the ability to set the time. This is done by lifting the center switch (a very short toggle switch that takes a fair amount of force to move, so this would be hard to do by accident): each use of the switch selects the next settable value (hour, minute, month, day, century, year, and the six option settings shown above), and the pushbuttons raise or lower the displayed value. Click here for some technical details on the clock, and pictures of the circuitry inside. The Nixie tube in this clock shows substantial signs of wear: my old video camera isn't capable of capturing it, but there is a blue haze surrounding some of the digits when lit. While it may continue to work adequately for another year or so, the buyer is going to need to think about finding a replacement. There are no markings on the original tube, but it appears that standard types 5031, 5092, 6844, 8037, or 8421 would be suitable - search eBay for them. IMPORTANT NOTE: This clock is designed to run on 120 volt, 60 Hertz AC, which basically limits its use to the USA and Canada. It WILL NOT work elsewhere in the world. Foreign voltage adapters won't help: they cannot do anything about the 50 Hz powerline frequency used most other places, and therefore the clock would run at 5/6 of normal speed. The winning bidder is to pay actual shipping charges, which will need to be calculated once the auction ends - figure about 4 pounds shipping weight. You can pay with a credit card via PayPal, or mail me a postal money order if you prefer. This wasn't quite the clock you were looking for? Check my other auctions, I have another Nixie clock currently available. That wasn't it either? Click here for information on other unusual digital clocks that I've built or am working on, and a link to sign up for notification whenever I have one available on eBay.